Is OMG something to write after your name on your official correspondence — one of the orders of British knighthood, perhaps? Hat-tip: Smithsonian, via Jeff Gates. This entry was posted on Thursday, November 29th, 2012 at 7:39 pm	and is filed under britain, Charles Cameron, internet, language, Religion. You can follow any responses to this entry through the RSS 2.0 feed. Both comments and pings are currently closed. The ‘new’ order of Knighthood ‘on the tapis’ would be the Order of the British Empire, founded in 1917, “in recognition of the large numbers of people in the British Isles and other parts of the Empire who were helping the war effort both as combatants and as civilians on the home front” Fisher’s allusion is, I assume, ironic since he is saying that the Navy is incapable of operations outside home waters. 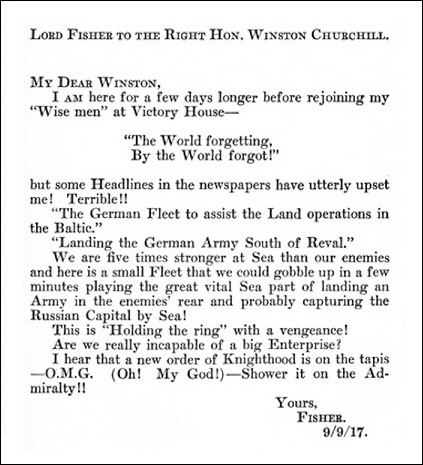 Fisher, in retirement, writing to Churchill about German landings in the Baltic is rubbing salt into a wound; Fisher had bitter arguments with Churchill against the disastrous Galipoli campaign, pushed through at Churchill’s insistence, and had, instead, been a strong proponent of using the navy for Baltic landings to attack Berlin. Thanks for that excellent addition and summary of the “real” OMG — I still find it hilarious that “OMG” was already being used in 1917 in the sense in which netizens use it today, but good to know that it was a play on an actual award. In fact, I should have recognized the “MG” myself, since Trevor Huddleston was KCMG. Thanks again for pointing it out!